Come see for yourself what all the buzz is about––poems like you’ve never heard them performed before! 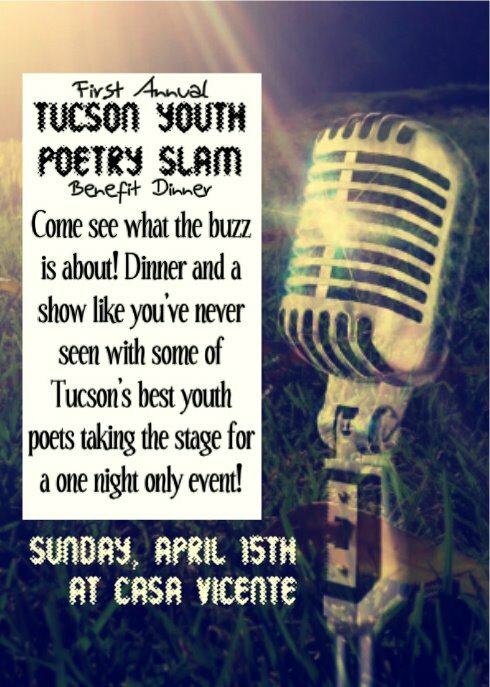 Some of Tucson’s most talented youth poets will take the stage for a special one-night-only event to benefit the Tucson Youth Poetry Slam––you won’t be disappointed! The TYPS is a dynamic program which helps young people from across the city learn self-expression, literacy, and performance. 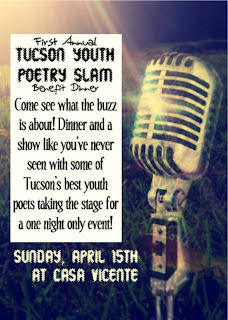 Ticket price includes full three-course Spanish dinner and a chance to support new opportunities for youth voice in Southern Arizona. All donations are tax deductible! A collaboration between the youth-led TYPS Fundraising Committee and students from the Blue Chip Leadership program at the University of Arizona. Tickets are $35 per person and include both admission and the meal. Please call 602-478-0980 to order tickets and specify any necessary dietary needs before space runs out! Can’t make it to the Dinner? Please include “TYPS” on the memo line.